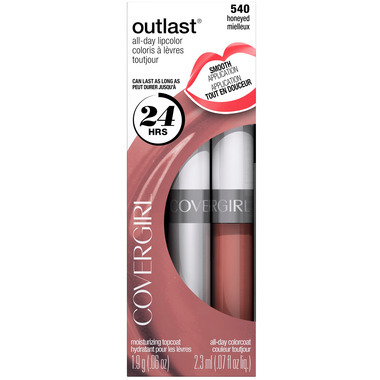 CoverGirl Outlast Lipcolor is CoverGirl's original long-wear lipcolour! Its advanced formula with resilient, brilliant coverage, colour and shine gives you up to 16 hours of colour that stays true in just 2 easy, breezy steps. Outlast has a moisturizing topcoat that helps lock in shine - no feathering, no bleeding. Beautiful shades that are food proof and transfer resistant all day!